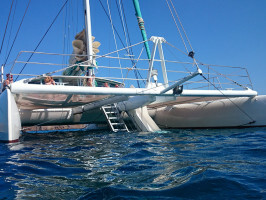 Come join us on our catamaran Catlanza and enjoy our Pirate Sailing Adventure. 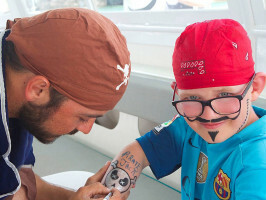 All kids will be given bandanas and pirate face painting. 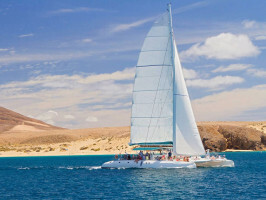 Imagine the pleasure of boarding a luxury catamaran from the beautiful marina of Puerto Calero as you embark on the ideal sailing charter to the golden beaches of Papagayo. 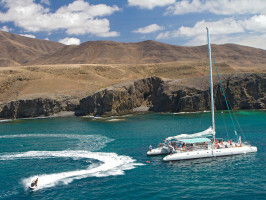 With Catlanza´s memorable crew, you are assured of the most friendly and relaxed service in Lanzarote. So why not sit back and be pampered with the thought you always had … that life is all about indulgence. 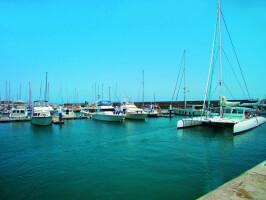 Anchoring in a sheltered bay, now is the time to explore the marine life in the crystal clear waters. Make the most of the snorkeling equipment and gain knowledge from our dedicated crew. 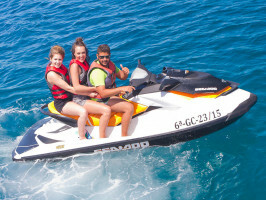 For the more adventurous, let one of the instructors tempt you with an exhilarating jetski ride around the bay. The local tour provider is able to accommodate visitors with wheelchairs or with walking disabilities. Please bring a bathing suit, sandals, towels and comfortable clothes.